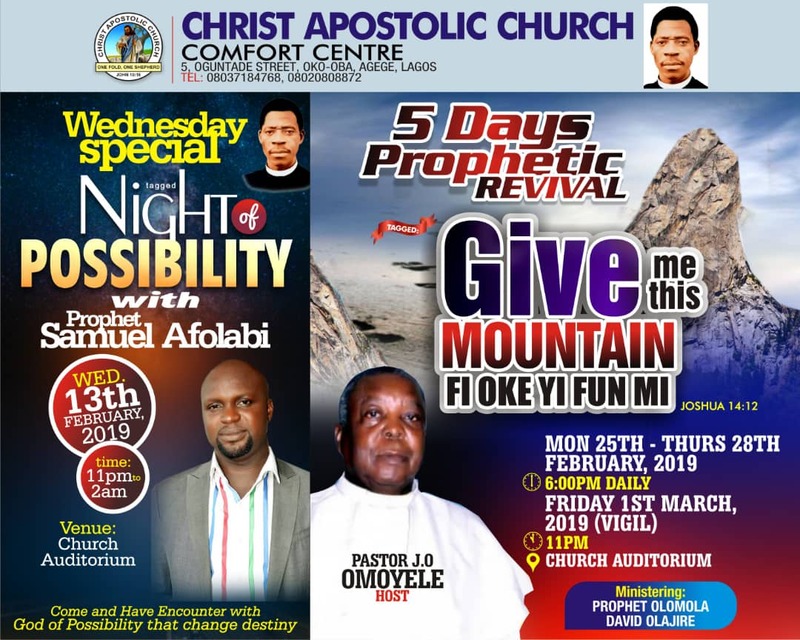 Christ Apostolic Church, Comfort Centre, Oko-Oba Agege Lagos will today Wednesday February 13, 2019 holds "Night of Possibility with Prophet Samuel Afolabi" programme. The programme starts by 11am to 2am at the church which situated at 5, Oguntade Street, Oko-Oba Agege Lagos. Similarly, the church will hold a five day Prophetic Revival from Monday February 25 to Friday March 1st, 2019. 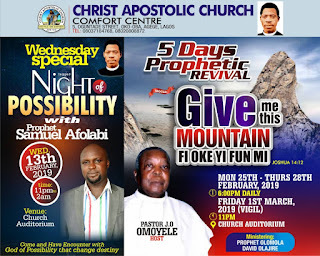 The theme of the programme is "Give Me This Mountain"
CAC NEWS gathered that the programme will hold by 6pm from Monday 25 to Thursday 24, February, while the grand finale will starts by 11pm on Friday March 1, 2019. Pastor J. O. Omoyele is the host, while Prophet Olomola David Olajire is the guest minister.